This issue of Primary Care: Clinics in Office Practice, guest edited by Drs. 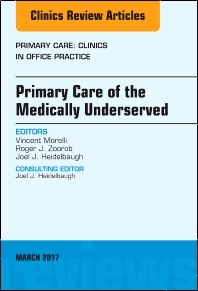 Vincent Morelli, Roger Zoorob, and Joel J. Heidelbaugh, is devoted to Primary Care of the Medically Underserved. This outstanding issue includes the following articles: Primary Care Issues in Rural Populations; Primary Care Issues in Inner City America and Internationally; Medical Care for Undocumented Immigrants: National and International Issues; Pediatric and Adolescent Issues in Underserved Populations; Women's Health issues in Underserved Populations; Geriatric Care Issues: American and International Perspectives; Medical Care of the Homeless: An American and International Issue; Cardiovascular Issues in the Underserved; Occupational Health and Sleep Issues in Underserved Populations; Infectious Diseases Issues in Underserved Populations; Cancer in the Underserved; Psychological Issues in Underserved Populations; Substance Abuse Issues Amongst the Underserved: American and International Perspectives; Diet and Obesity Issues in the Underserved; Exercise/Sports Medicine Issues in Underserved Populations; A Global Perspective on Climate Change and Health in Underserved Populations; and International Comparisons in Underserved Health: Issues, Policies, Needs and Projections.